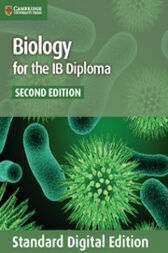 Biology for the IB Diploma, Second edition covers in full the requirements of the IB syllabus for Biology for first examination in 2016. This digital version of Biology for the IB Diploma Coursebook, Second edition, comprehensively covers all the knowledge and skills students need during the Biology IB Diploma course, for first examination in 2016, in a reflowable format, adapting to any screen size or device. Written by renowned experts in Biology teaching, the text is written in an accessible style with international learners in mind. Self-assessment questions allow learners to track their progress, and exam-style questions help learners to prepare thoroughly for their examinations. Answers to all the questions from within the Coursebook are provided.